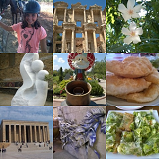 As a Windows Phone game app, Pair Photos Memory Game is a simple yet entertaining and educational game for all ages. Each time you start a new game, this WP8 memory game selects 8 random photos from your Photos album and places on the game board for your match. 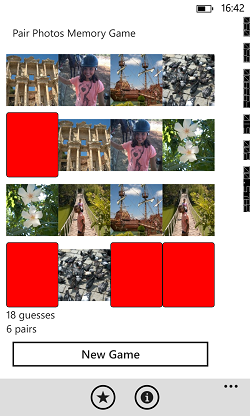 Selecting pairs from photo library makes the game renewing itself each time and make the memory game more enjoyable. Pairing games have always been a preffered game type for parents to let their children to play. Memory games like pairing matches improves the concentration and focus abilities of the kids. Besides let the children increase their memory skills. 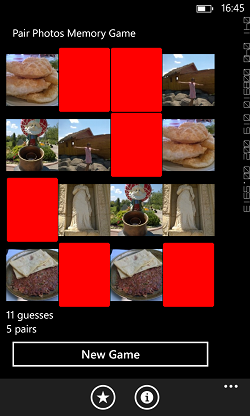 Pair Photos Memory Game is free on all Windows Phone stores. Right now, this pairing Windows Phone 8 game supports three languages English, German and Turkish. I'll be very happy if you can help me for translating this game into other languages. You can always get in contact with me using kodyaz@outlook.com email address. If you own a Windows Phone 8 OS running smartphone, you can visit your Windows Phone Store to download and install the Pair Photos Memory Game app on your phone. The download size is less then 1 MB and it is free.